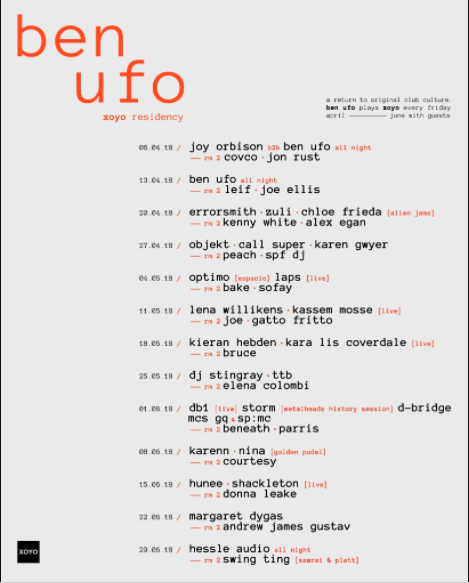 Ben UFO has announced a 13-week residency at London’s XOYO and each party is looking uniquely amazing. The Hessle Audio founder will play the venue every Friday night from 6th April to 29th June accompanied by an incredible cast of guests. The first date, for instance, will find the inimitable selector playing b2b with the mighty Joy Orbison in Room 1 while Covco and Jon Rust take over Room 2. Ben UFO teased that he would be making this announcement last week with a mysterious mix and mail-out registration but this is even better than we had dreamed. Check out the full breakdown of the residency below. This announcement comes after a series of excellent residencies held in XOYO from the likes of Artwork, Motor City Drum Ensemble and The Black Madonna.